Along with the directive that presents the network speed results in within a nice customized user interface, the module offers a service that is able to provide raw network speed data measurements also. 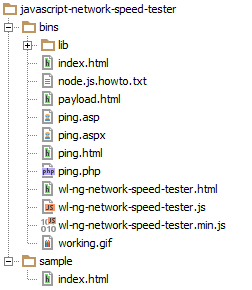 The service can be used to build other directives or it can be used to make a standalone application that presents the broadband test results in own UI or use them in any other scenarios. Bottom line is that the service will offer raw measurement data on demand without any UI, leaving the developer the freedom of choice to decide what to do with the data.